You read that headline correctly. Terry Urban has gone ahead and made his own kind of Grey Album. Urban has mashed up Jay-Z and Coldplay into an album he has titled Viva La Hova. I was totally taken aback because I never would have thought of matching those two artists, but I guess that actually might be why this idea sort of works. I’ve got something of a weak spot for mashups, more for the idea than the result. In general, I sort of like the idea of putting two incongruous artists together into something new. It either really adds something to an artist or abruptly forces you to rethink why you liked the artist in the first place. This album does both of those things. Listen to the Life of Clocks and you’ll get what I mean. Coldplay’s mellow beats honestly overwhelm Hova’s rhymes, and it seems like it sort of exposes Jay’s lyrics as being just absurd. On the other hand, a track like Science is Ignorant works a little bit better. But yes, the end result (as with most mashups) is that it entertains you for a few minutes and then you sort of get bored of it. But it’s worth looking at. You can download the album here. Thanks again to Metafilter for digging this up. It’s a mashup of some of hip hop’s big names with strange Zelda midi tunes. It’s just the type of nerd-tastic enterprise that lights the internet on fire. However, the execution of this album does leave something to be desired. It’s hard, because I really want to appreciate the work that someone obviously put into the album, but it’s not entirely smooth. Many of the tracks (I think especially the Dr. Dre mashup) seem hasty and unfinished. Almost to the point where I kind of wish different vocals were used. However, a few worked out better than others. Common’s I Used to Love H.E.R. worked pretty well. The best sounding one has to be Aesop Rock’s No Jumper Cables. The MF Doom track worked pretty well, simply because his rhyme style lends itself to a variety of beats. I think too many of the failed tracks simply didn’t work because the artist’s flow was so tailored to the actual beat. Doom manages to be choppy enough that you can pretty much put him over anything you want and make it sound like it was designed to be that way. You can stream it all here. Most disturbing Lil Jon matchup ever created by man. Seriously. This is creepy. I can’t even tell you how much it disturbs me, especially because it looks like a lot of time and effort went into syncing this together. It’s a mashup of Lil Jon and Lazy Town, an Icelandic children’s program. It’s aired in Canada on YTV and in the US on Nick Jr. Still, it’s taking the internet by storm and really starting to get some notice. Check it out. 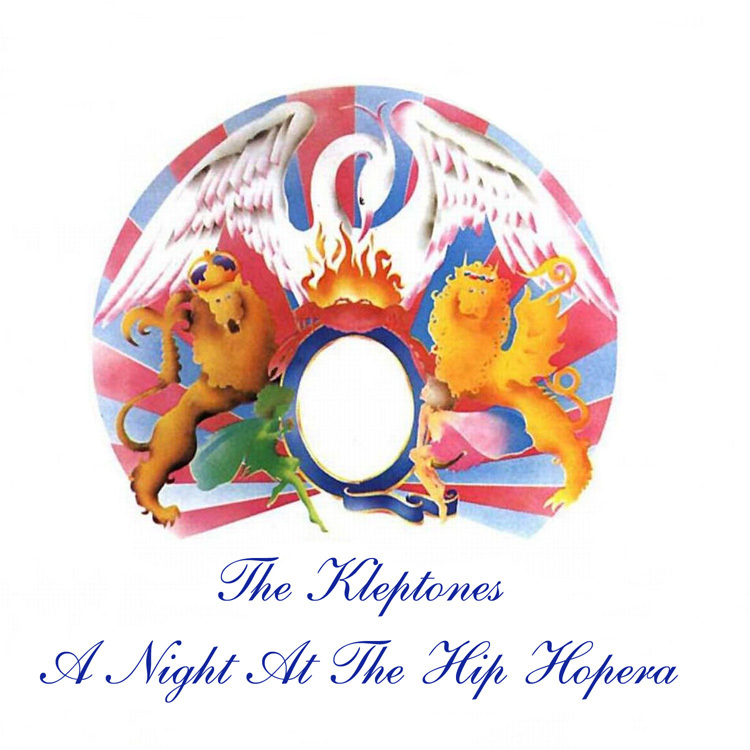 As yet another notch in the mashup belt, 4080Records presents the Kleptones, a Night at the Hip Hopera. This curious mixtape is a dash of Queen with all kinds of hip hop. Literally, it’s kind of one mega hip hop ballad thing. Although this record was technically banned by the record companies, it still remains for download from the Kleptones’ website. You can check out one of the tracks off the album, titled “Jazz”, here. This is definitely not the matchup I had anticipated, but to be honest this is probably one of the 5 best mashups/remixes I’ve ever heard. It’s a mix between Paul Simon’s “50 ways to leave your lover” and Slick Rick’s “Women Lose Weight”. The original Slick Rick song, a collaboration with Morcheeba, had an eerie jazzy and happy feel to it, considering the song was all about how the character killed his wife because she gained some weight, and he wanted to run off with his hot secretary. Definitely not children’s material. Still, it’s rare that you find two songs that match so well in sound and (sort of) in topic. Simon’s chorus about looking for ways to leave your lover is a strong counterpoint to Rick’s murderous intentions. I think they play off each other pretty well, and I suggest you listen to it below. So I guess I actually do love mashups. It’s official. The Bootie Blog is a monthly assortment of hilarious mashups from a variety of deejays. It various from rock to hip hop, and even stupid amounts of pop music. Here’s just a quick sample of some of the stuff they post. I think it’s hilarious. Either Earworm is a musical genius, or this just proves how all the biggest hits from last year were pretty much the same song anyway. Come to think of it, it’s probably both. This is a mashup tour de force that says more in five minutes about the current state of contemporary pop music than any music blog ever could.